Sadis has been involved with the creation of various investment products as well as many distribution models, including seed transactions, acceleration capital, creation of hedge fund platforms, joint ventures, and the retention of third party marketers. Working with over 1,000 funds, the firm is actively involved in the most current legal trends in the industry. 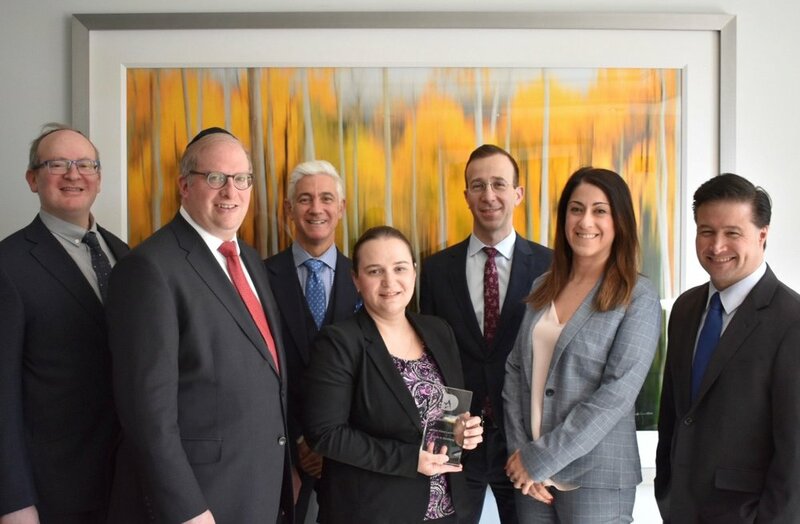 Some members from Sadis & Goldberg’s Financial Services Group receiving Hedgeweek’s 2019 Best Global Law Firm Award. Financial Services Group: Ron Geffner, Yehuda Braunstein, Richard Shamos, Yelena Maltser, Erika Winkler, Paul Fasciano, Jeffrey Goldberg, Gregory Hartmann, Steven Huttler, Paul Marino, Robert Cromwell and Nick Federici. Sadis attorneys routinely handle a diverse range of enquiries, providing legal counsel to domestic and international financial institutions, family offices, hedge funds, private equity funds, venture capital funds, real estate funds and commodity pools. In addition to the Financial Services Group, Sadis & Goldberg provides a full range of sophisticated legal services, including corporate transactions (acquisitions and divestitures), securities litigation, regulatory and compliance, tax, commercial and employment litigation and arbitration, corporate governance and shareholder activism, derivative transactions, M&A litigation and appraisal rights, as well as investor due diligence.